This is the 2nd trip since the first sold out! You Betcha! Don't Cha Know! Uff Da! From the basement to the barn, your beloved Church Basement Ladies are back and getting busy with life outside the kitchen. After the last hot dish is served, the coffee pot is drained, and the JELL-O molds are put away, these steadfast women head to their homesteads, peel off their good girdles, and get on with their daily chores. In between picking eggs and dusting knickknacks, the Ladies congregate with some of the other characters who inhabit their community. 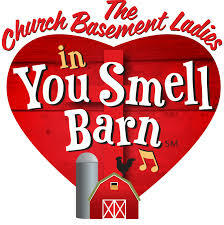 YOU SMELL BARN celebrates rural life in the 1950's with plenty of crazy antics, loads of fresh laughs, and spanking new original songs! MENU: Full soup and salad bar, turkey breast with gravy, mashed potatoes, seasonal vegetable, fresh bread and butter, assorted desserts, coffee, water and lemonade. A fun stop at Abdallah Candies in Apple Valley starts our day. Observe chocolate-dipping in action, taste some candy samples, and shop for some goodies to bring home if you wish. Cost: $97 Includes: Transportation, lunch, entertainment, snacks on bus, gratuities and driver tip. Early Bird Savings: Take $5 off if booked and paid by November 30. Departs: Please arrive 10 – 15 minutes early for boarding to depart “on time”. Arrive back first stop approximately 4:30 p.m. in reverse pickup order.